One of my ways of dealing with long telephone conversations is to click on the computer and peruse aerial views of American cities. Alas, in contrast to the picturesque historic cores of most European cities, many of our urban hubs consist of a scattering of tall banks and office buildings grounded with acres of surface parking lots. My own city of Richmond is not exempt from such scenes. Acres of asphalt are a lifeless specter and a depressing one when we realize that these empty expanses once held architecture. Though denuded of buildings, the lots remain serviced by the full range of public facilities: power, water, sewer, communication, transport, etc. We have created dead zones at the expense of the critical mass necessary to keep a city vibrant. In some places, the urban land is too valuable for such wasteful use. Hence, we see tall buildings with ancillary parking decks. [i] Regrettably, many the decks of recent decades are as visually stifling as the surface lots. (Figure 2) These vapid works of naked engineering are little more than concrete shelving to store our vehicles, blaring the fatuous rationale that form follows function. 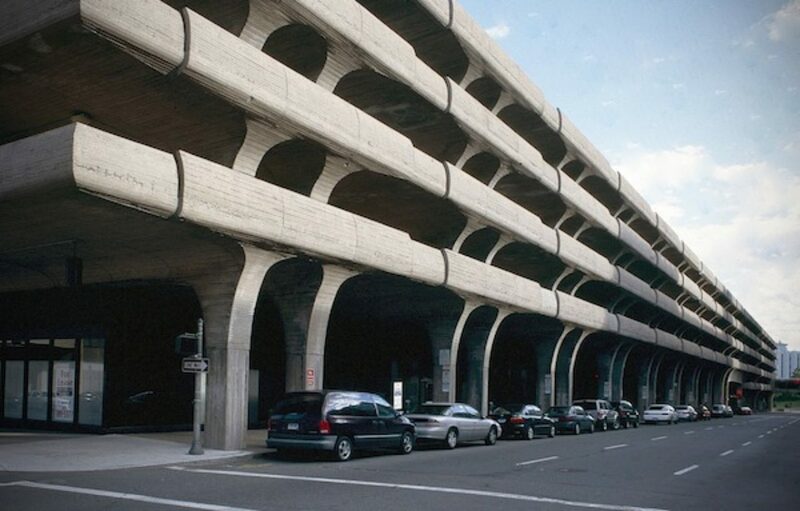 A more famous early effort at making a parking deck a work of architecture is Paul Rudolph’s 1962 Temple Street Parking Garage in New Haven. (Figure 5) This sprawling cast-concrete work is an arresting but effective expression of Rudolph’s Brutalism. Rudolph cogently stated his approach to the design: “Most parking decks are merely skeletal structures which didn’t get any walls. They are just office structures with the glass left out. I wanted to make a building which said it dealt with cars and movement. I wanted to be no doubt that this is a parking garage.”[iii] A masterpiece of concrete formwork, Rudolph’s structure is alive with movement and has become a classic in its own unique way. As many know, Santa Fe has rigid architectural controls in its historic core, enacted to preserve the city’s traditional visual character. 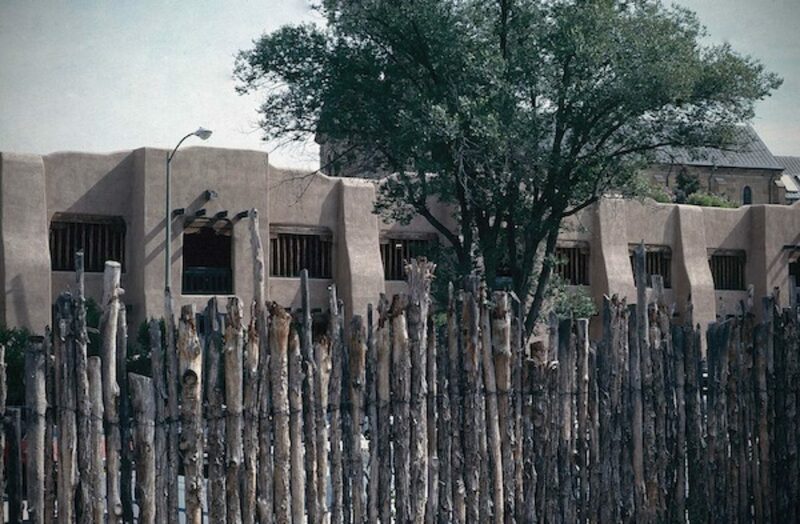 The city code defines in detail the features of the “Old Santa Fe Style,” consisting of adobe construction, flat roofs, small openings, earth colors, and other indigenous qualities based on the adobes of the region’s Pueblo Indians. 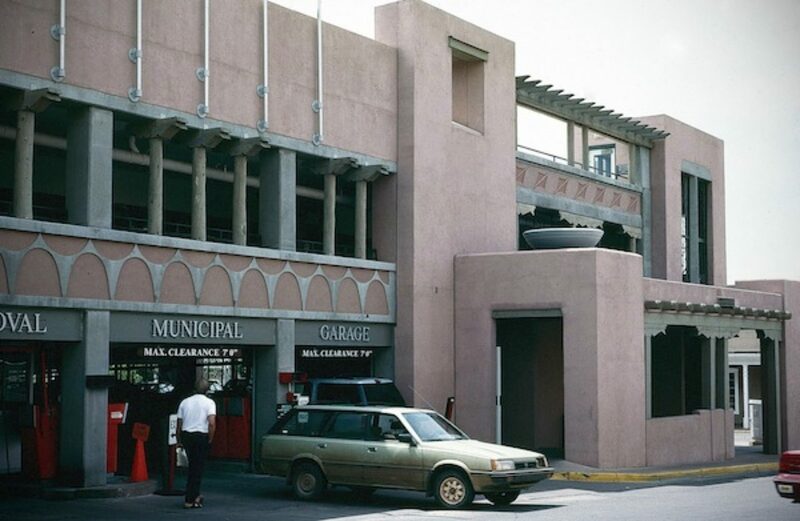 It also defines “Recent Santa Fe Style”—the 20th-century interpretations of the Pueblo style, an image required for new construction to maintain architectural cohesion in the city’s historic quarter. While some may object to such stylistic rigidity, Santa Fe has become world-famous for its unique harmonious ambiance. This control is evident in two of the city’s parking decks. The first, in the shadow of Santa Fe’s historic basilica, could easily be mistaken for a vintage agricultural structure. (Figure 6) The other, in the commercial area, has a more architectonic quality with its complex massing. Pueblo-style forms and details are augmented with an ornamental Moderne-style frieze and even a Wrightian shallow bowl. (Figure 7) It would be simplistic to dismiss these structures as silly instead of seeing them as serious and successful efforts to respect a greater whole. 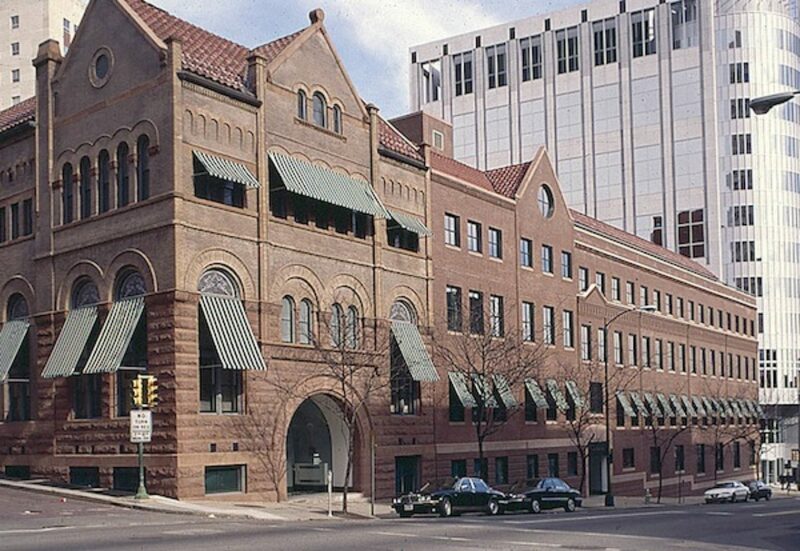 Two venerable Richmond religious congregations: St. James’s Episcopal Church and Beth Ahabah Temple formed a partnership to erect a parking deck on a surface lot across the street from their adjacent houses of worship. 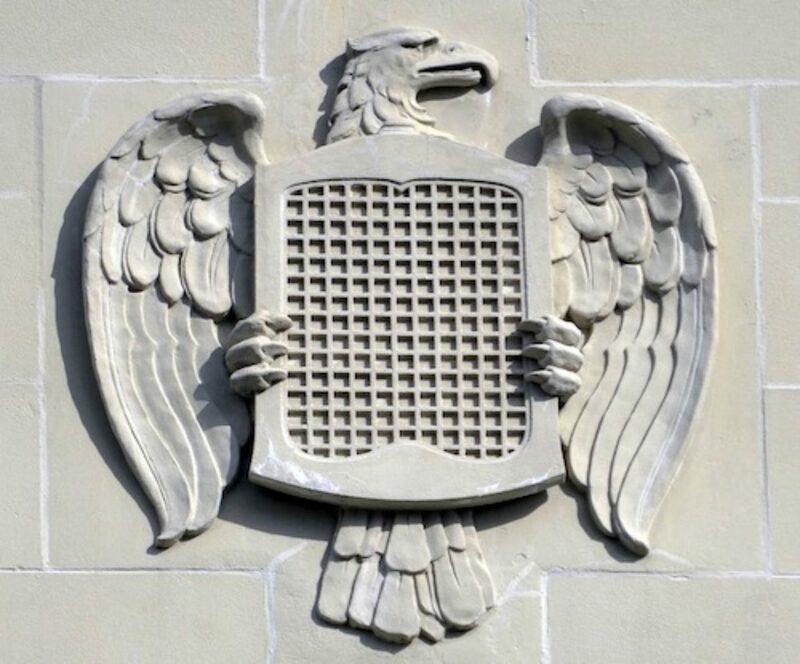 Opened in 1998, the resulting facility easily blends with the neighborhood’s early 20th-century architectural assemblage. 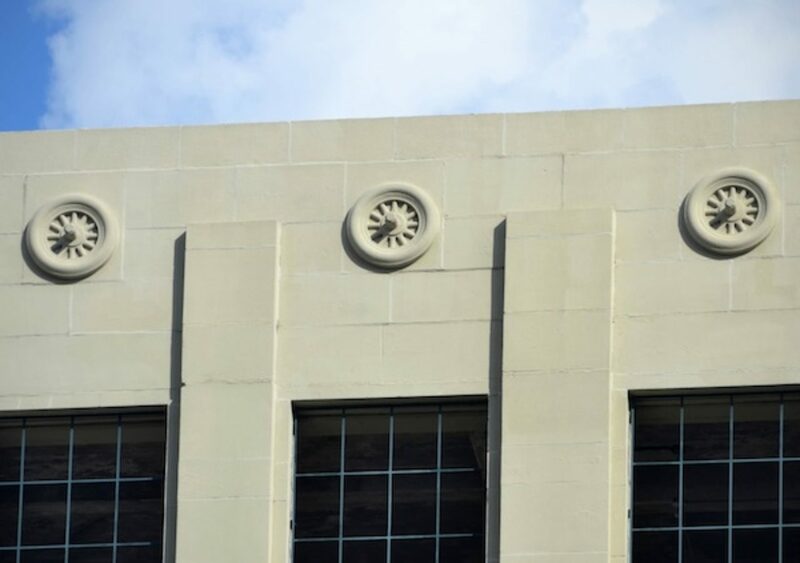 (Figure 8) Designed by the local firm of Marcellus Wright & Cox, no attempt was made to disguise the deck as something else; it is obviously a parking deck but given a dignity of appearance with an unassertive classical façade. The exterior of a small apartment house on the far corner was preserved and incorporated into the scheme. This existing building’s scale and cornice lines shaped the design of the deck. Shunning the usual low slit, the deck’s entrance is made inviting by a large arch supported on Tuscan columns. 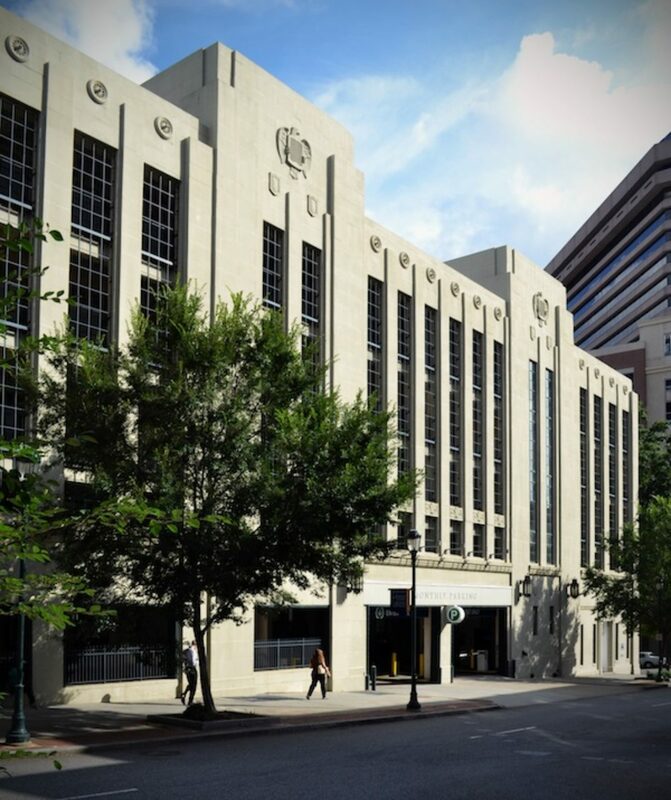 In the 1980s the Richmond firm of Glavé, Newman, Anderson, the predecessor of Glavé & Holmes, was commissioned to design an office addition and parking deck to the Romanesque Revival Planters National Bank. Erected in 1893, the bank building was slated for demolition but received a last-minute reprieve, and was restored to house the Virginia Retirement System. Its extensive addition, built on an unsightly parking lot, has been hailed as a deftly successful appendage to a landmark structure. 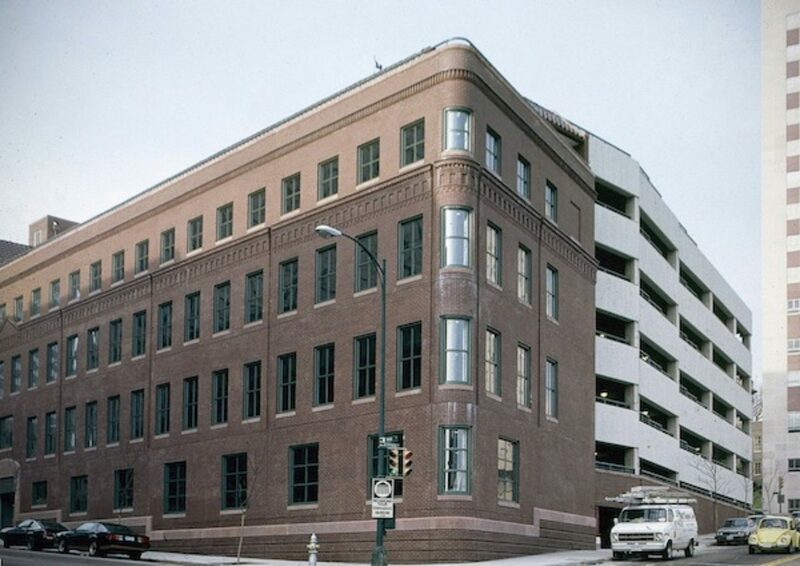 (Figure 10) The addition’s long façade masks a parking deck attached to the rear. While screened from Main Street, we might wish that the deck were not such a jarring contrast to its fronting structure. (Figure 11) A combination of budget and then-current philosophy may have dictated the deck’s functional design. 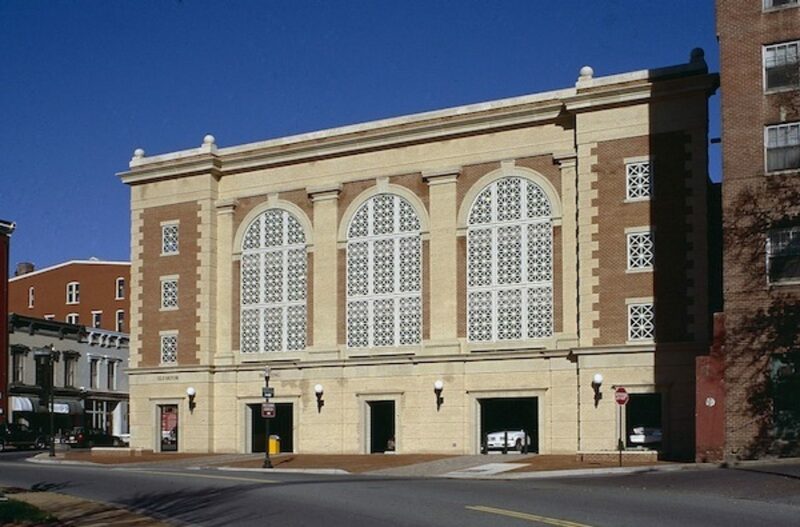 We must look to the small city of Staunton, Virginia for the grandest parking deck in this survey. Here we are met with a stunning edifice designed by the local firm of Frazier Associates. (Figure 12) The goal was to provide a monumental sense of arrival into Staunton’s downtown historic district, a classic Victorian cityscape. We might ask what is the most welcome sight for a visitor entering a strange city? The answer, of course, is a place to park, so why not treat it with fanfare. With its huge arches framed by pilasters, the design takes its cue from the great railroad stations of the early 20th century, structures that also celebrated arrival. They in turn were inspired by the ancient Roman baths, likewise splendid public amenities. Contrasting with the garage’s façade, the side elevation is treated as a row of commercial buildings offering ground-level retail space, including the city’s Visitors’ Center. (Figure 13). 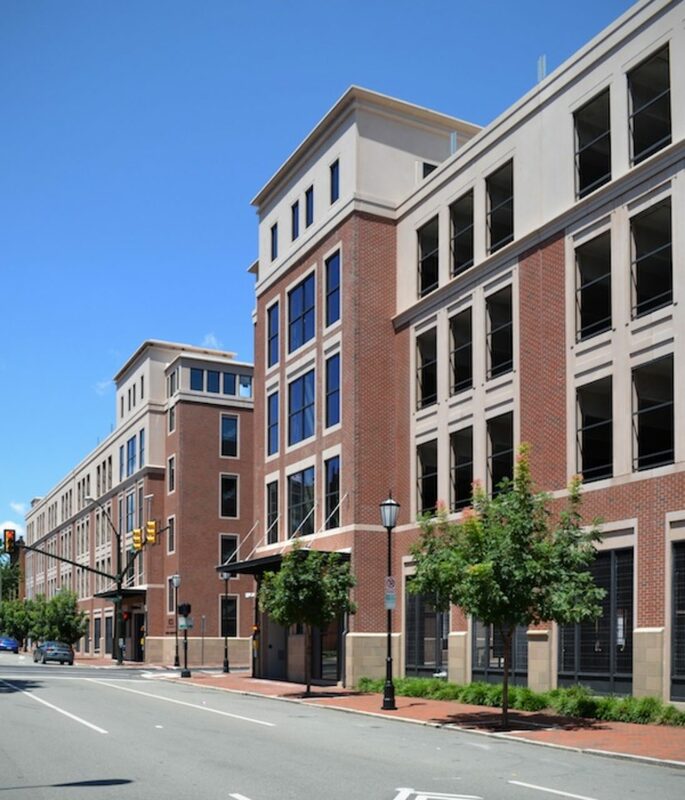 Opened in 2000, the parking deck was a recipient of a Palladio Award from Traditional Building Magazine. 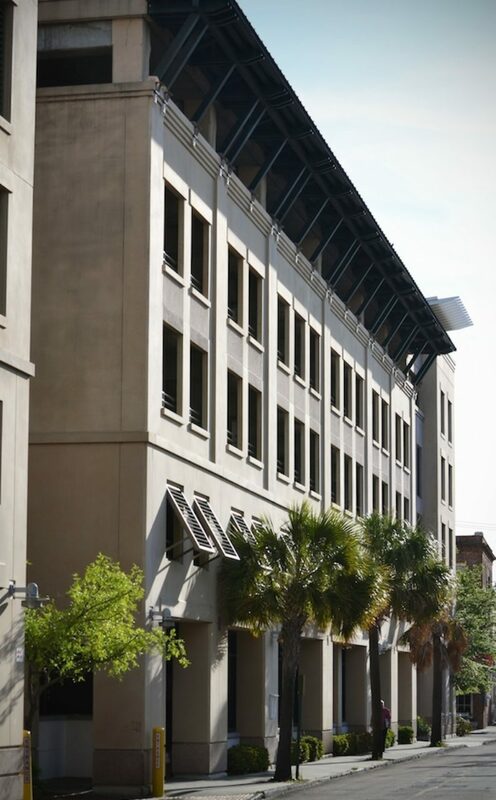 Designing compatible infill buildings in Charleston, South Carolina presents a challenge when local policy discourages new construction from pandering to the city’s remarkable legacy of historic buildings. Though well intended, such a policy risks producing new works so consciously non-historic that they appear glaringly out of place or just boring. 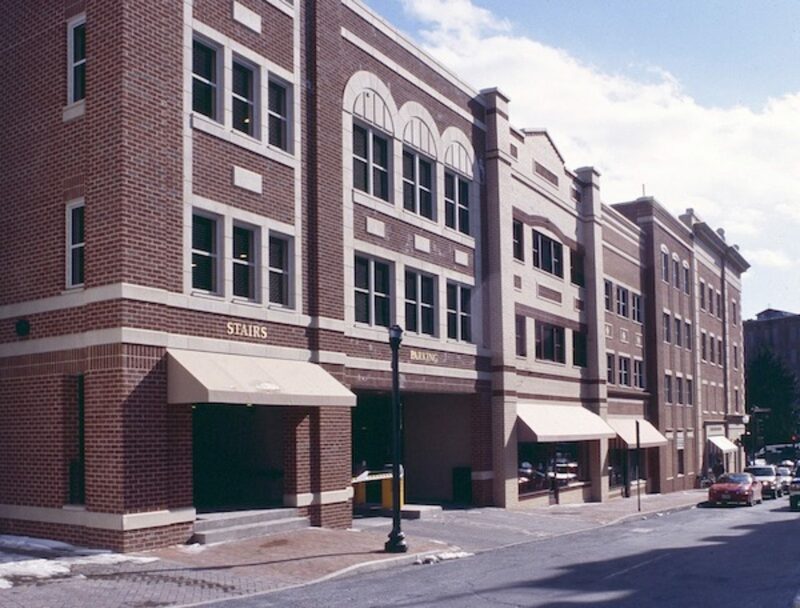 Thus, when the local firm of Stubbs, Muldrow, and Herin was commissioned to extend the Cumberland Street Parking Garage in the heart of downtown, it took care to give the addition a sense of place and make it a visually distinguished work on its own. (Figure 14) The clearly modern bracketed cornice shading the upper level reflects the weighty cornices of mid-19th-century Italianate commercial buildings. The subtle variation in the grouping of the openings avoids a monotonous rhythm. Louvered blinds on the second level add a ‘Southern’ flavor. Landscaping enhances the Cumberland Street elevation while the Church Street façade has commercial space at street level. Completed in 1998, the garage projects a timeless dignity. 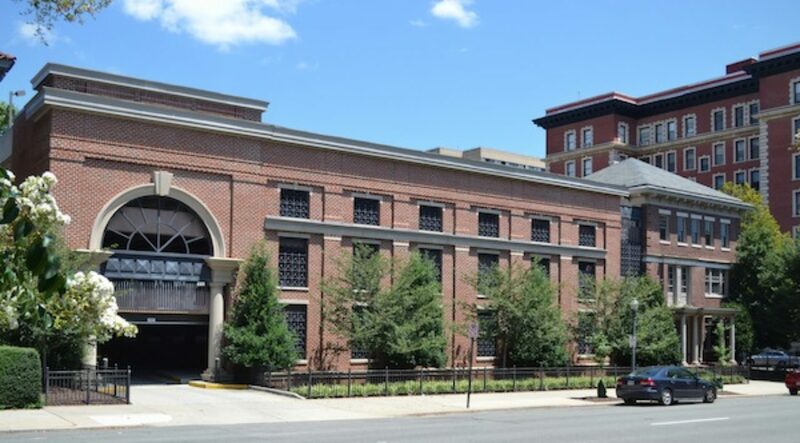 We will now consider two historic district parking decks that make an honest but less successful attempt to respect the character of their surroundings. 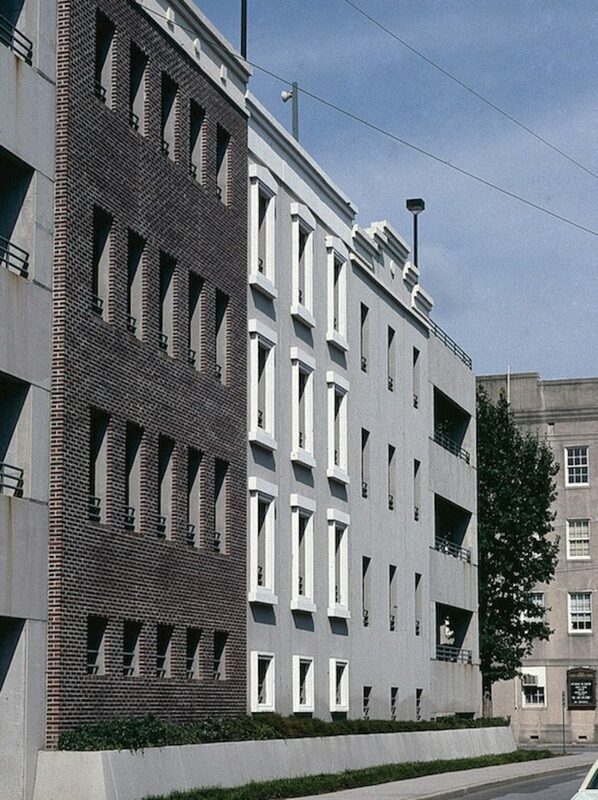 The first, in Savannah, Georgia, references the verticality of district’s Federal and Greek Revival townhouses by having its façade divided into several units punctuated with a series of narrow vertical openings instead of ribbons of horizontal slits. (Figure 15) The individual sections are varied by the use of different materials and differing opening treatments. Unfortunately, their lack of articulation leaves the openings with a hard, blank character. In short, the building tries too hard to be polite. On the other hand, the ‘Autopark’ on Winchester, Virginia’s Cameron Street, offers some deference to the city’s historic district with its rusticated lower level and grouping of the openings in segmental arched panels set off with different colored brick. (Figure 16) Even so, the openings could have been treated with something more interesting than skinny dark railings. And we must wonder why it was necessary to have the deck set back from the street with surface parking in front. Isn’t a parking deck supposed to obviate the necessity of surface parking? The Virginia seat of government in Richmond has an insatiable appetite for parking, for both state employees and elected officials. 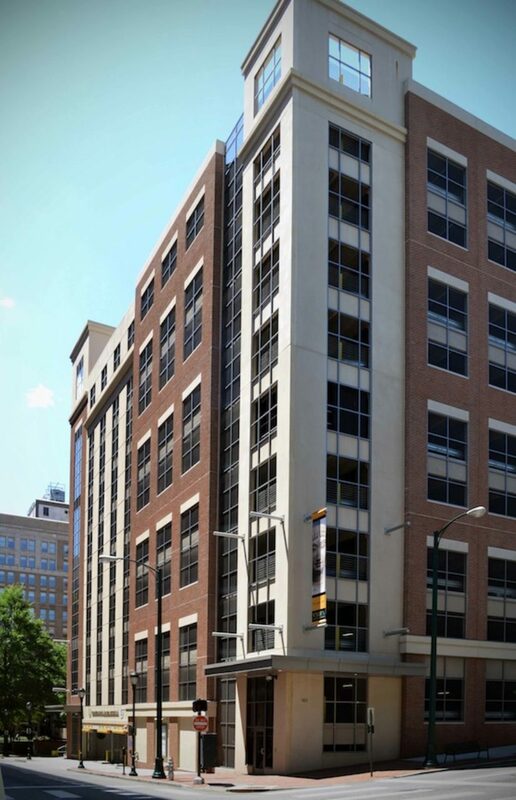 To meet the demand for more automobile housing, the Virginia Department General Services undertook the construction of a twelve-level high-rise garage that would hold 1006 cars on a vacant site two blocks from Capitol Square. 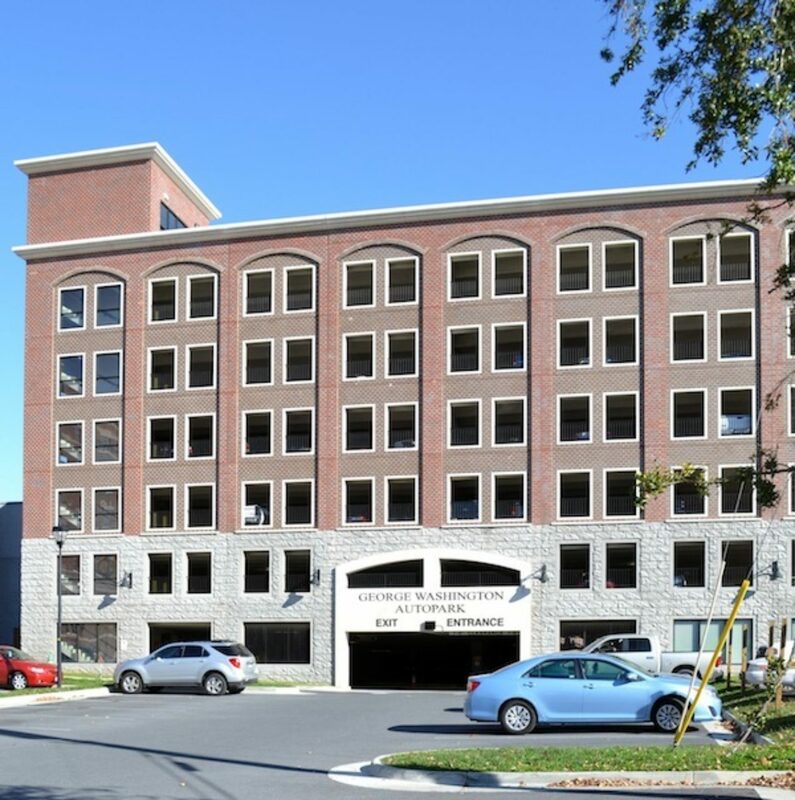 (Figure 17) Opened in 2011, Commonwealth Architects of Richmond made every effort to have the garage blend seamlessly with the surrounding tall office blocks. With its varied materials and modified traditional character, the building does just that. It makes no attempt to disguise its function, but it doesn’t scream it either. Instead, the massive structure settles in comfortably with its surroundings. It was hoped that the ground level could accommodate retail space, but studies indicated the market demand to be insufficient to support such use. 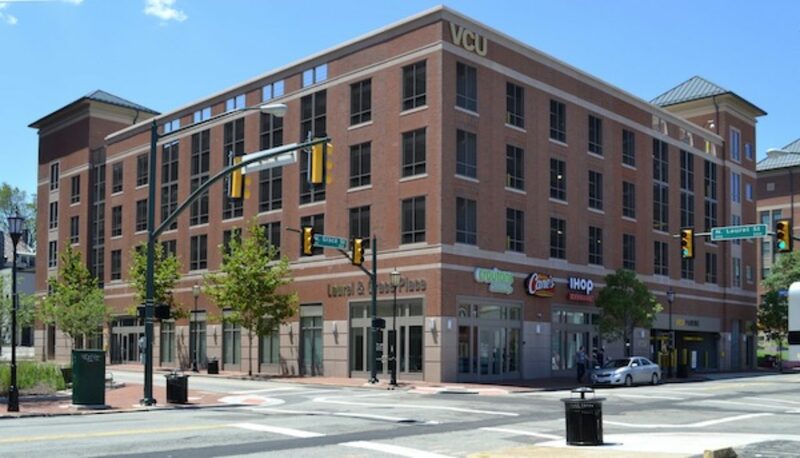 Lastly, I would like to share two more recent Richmond parking decks that I think are worthy of mention, both of which were built by Virginia Commonwealth University on vacant parcels in an otherwise dense urban neighborhood. The first example is a pair of decks on Grace Street, designed by SMBW Architects, a local firm, and completed in 2011. 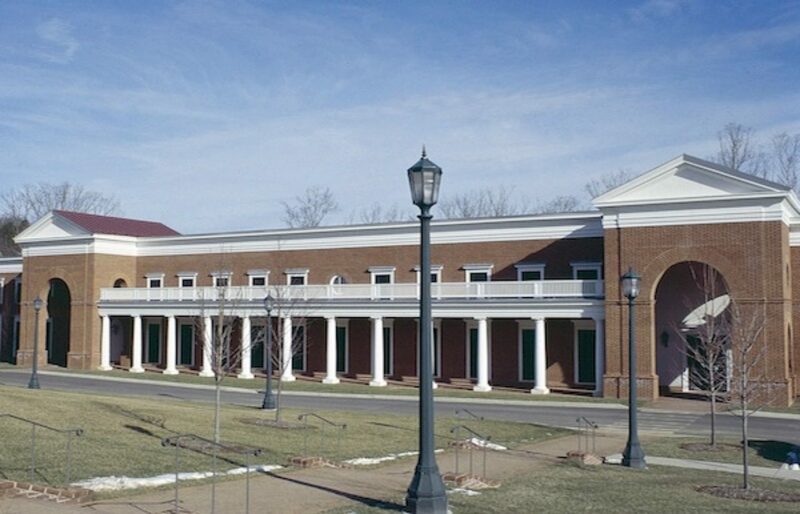 (Figure 18) Care was taken to respect the neighboring architecture by using red brick and tan cast stone. The façades exhibit a pleasing rhythm with the clustering of the openings into three-unit bays and by articulating the corners with bold elevator towers. The ground-floor bays have been designed for conversion into retail spaces whenever warranted by the economy. Several blocks to the west is the just-completed parking deck at the intersection of Laurel and West Grace streets, by WDG Architects of Washington, D.C. (Figure 19) The design and massing of the structure is meant to complement a new student housing building at the opposite end of the block. As with the preceding Grace Street decks, definition is given to the design with corner elevator towers topped with pyramidal roofs. The top level is shielded by a parapet with lighting kept discreetly out of sight. The dense concentration of student activity in the area justified accommodating retail and other services in the street level. With the exception of Paul Rudolph’s parking garage in New Haven, the several examples illustrated here are not singular architectural masterpieces, but rather politely dignified efforts to address their contexts. Some do it better than others. Modernists might well scorn these works as stage-set design, but much of our architecture serves as scenery for our activities. 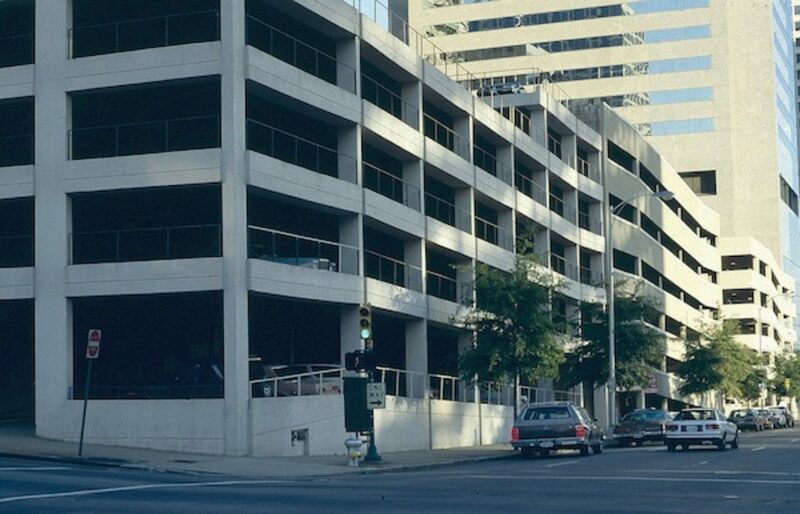 Parking decks are a necessity in urban areas. They can and should be visual amenities. I invite readers of this blog to share their images of interesting parking decks. We need such food for thought. [i] I make no distinction between the terms parking deck and parking garage. The terms are used interchangeably. [ii] Though a handsome work, the Sixth Street Deck replaced the Cunningham-Archer house, an important residence attributed Robert Mills. [iii] John Wesley Cook, Conversations with Architects: (New York, Praeger, 1975).